Do you have what it takes to be all you can be? We've always admired those people that do. Wanted to be just like them, but we have weak nerd arms. Couldn't do a pull up to save our life! But, we believe you have what it takes! So, take these Combat Hero Dog Tags for a spin and see how they feel. Do they fit your personality? Style? You can probably do 100 pull ups, then still be ready to take down any enemy! Defend your country! All without breaking a sweat. Or, you can just wear them as part of your Halloween costume. (That's what we would do!) 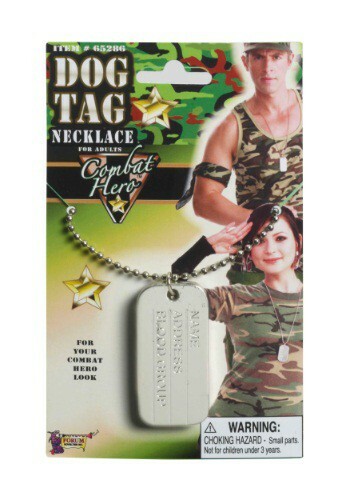 They would go well with anything from a Marine costume to Rambo or Arnold Schwarzenegger from Predator (or basically anything he's been in).